Here are 7 steps that will allow you to avoid or break the Metabolic Resistance Syndrome that is associated with toxic forms of obesity. 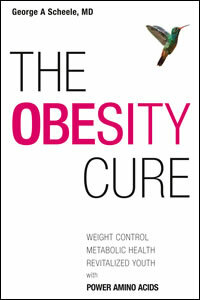 First, it is important for you to know if you suffer from obesity. This may be identified and confirmed when your waist circumference is more than half your height. Type 1 Obesity shows a normal body distribution of fat with enhanced central and peripheral fat pads. Type 2 Obesity shows excess belly fat with an increased belly/waist circumference indicating the presence of the metabolic syndrome. Type 3 Obesity shows both excess belly fat and excess peripheral fat, the most toxic pattern of all metabolic syndromes. Being unable to change how your body looks, no matter how much you exercise. Being unable to lose weight or keep weight off. Insulin normally regulates glucose distribution throughout the body and when inactivated promotes high blood sugar, which leads to the metabolic syndrome and a long list of chronic degenerative diseases that lead to accelerated aging and premature death. Leptin normally blocks hunger and when inactivated stimulates hyperphagia or overeating. Insulin and Leptin signaling is disrupted when blood sugar levels are elevated throughout the day leading to glycation of proteins, formation of glycation-end-products (AGEs), and inflammatory reactions caused by activation of the immune system, which further leads to excess deployment of oxygen-free radicals. Without going into the chemistry of each of these reactions the end-result is a massive inflammatory response to altered proteins throughout the body. Insulin and Leptin are only two of these proteins. There are thousands of other proteins in the blood stream and on cell surfaces that become irreversibly altered and dysfunctional. When this happens the hormone-receptor interactions and signal transduction mechanisms throughout the body no longer regulate biological functions as intended. The body is trying to mend itself but the continued assault by sugar, inflammatory cytokines, and reactive oxygen species (free radicals) leads to massive dysfunctions in the form of chronic degenerative diseases associated with the Metabolic Syndrome. Autoimmune diseases, including Rheumatoid Arthritis, Multiple Sclerosis, Crohn’s Disease, Ulcerative Colitis, Psoriasis, Eczema, Rosacea, etc. Increase your sleep to a minimum of 7 hours throughout the night and sleep should be “off-limits” to eating, television, video games or telephone calls. 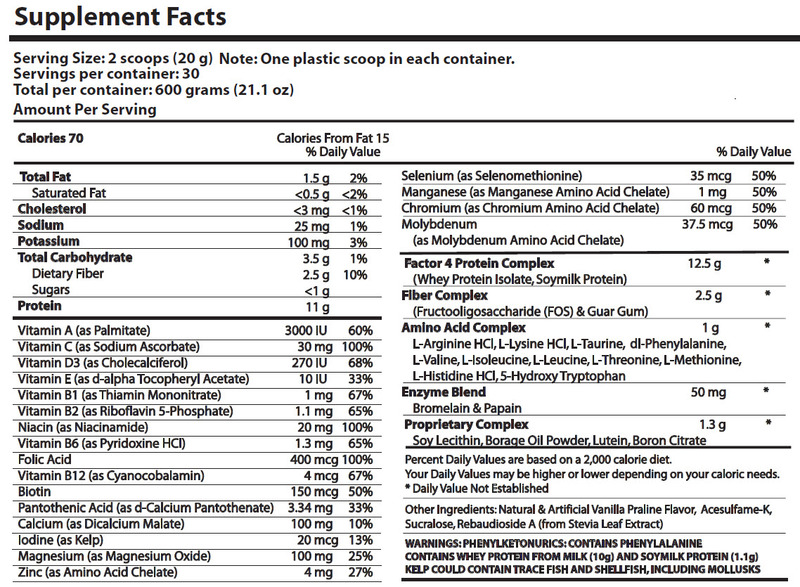 Lower caloric intake with Factor4 smoothies to provide meal replacements for breakfast and lunch. See http://blog.factor4health.com for Factor4 shake and smoothie recipes. Take Factor4 to reduce your sweet tooth allowing you to assume a very-low-carb diet (optimally <100g of carbohydrate a day) avoiding refined sugar and processed foods to lower carbohydrate calories and avoid those glycation processes described above that trigger metabolic resistance syndrome, which leads to chronic degenerative disease throughout the body. Take Factor4 to avoid all high-glycemic carbs, like bread, pasta, potatoes, cereal, crackers, chips, desserts and those sugary beverages. 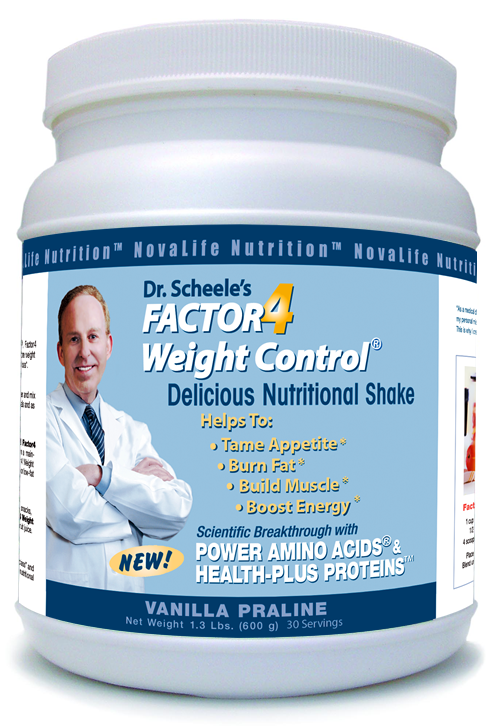 Take Factor4 to shift from animal-based foods to plant-based foods and thereby reduce your fat load. Enjoy healthy fats, including fish, chicken, turkey, eggs, low-fat milk, zero-fat yogurt, butter, and cheese in moderation to provide healthy saturated fats to preserve brain functions including cognitive skills and memory. Take Factor4 to sleep longer thereby extending your nighttime fasting periods. Increase heart-healthy omega-3 fatty acids through the ingestion of fresh-water fish, extra-virgin olive oil, and macadamia nut oil instead of unhealthy omega-6 fatty acids derived from vegetable oils and tasty chips. Supplement your omega-3 fatty acids with DHA/EPA supplements, at least 6 soft gel caps per day. Fish and krill oil are healthier than flaxseed oil. If you still have a weight-loss problem and want to lose those excess pounds, feel better and improve your metabolic health, increase your daily intake of Factor4 to 4 scoops per serving and increase your Factor4 intake to 4 shakes or smoothies per day. We call this Factor4 regimen a Factor4, 4 x 4. Since Factor4 has no harmful side effects, you can increase the daily intake to levels that will breakthrough stubborn weight-loss plateaus. Factor4 is built on innovative technology that suppresses appetite and restores metabolism using natural feedback mechanisms related to Power Amino Acids®. With patent protection and a unique proprietary formula Factor4 tames appetite and balances metabolism by correcting deficiencies in the food chain caused by poor nutrition, the food industry and the beverage industry. 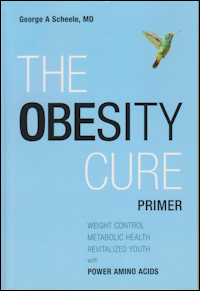 Dr. Scheele is a world-renowned physician, inventor, author and two-time Nobel Associate, who has pioneered in understanding the critical role of amino acids in regulating metabolic health and body weight. 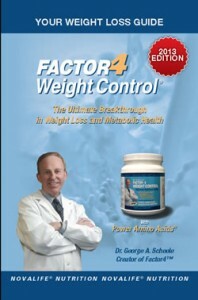 He recently introduced Factor4 Weight Control® with essential ingredients to treat the four nutritional traps that lead to overweight disorders and obesity. As a graduate of Princeton University and Johns Hopkins Medical School he served as Professors of Medicine on the faculties of The Rockefeller University, Yale University School of Medicine and Harvard Medical School. Dr. Scheele invented new concepts and techniques which “cracked the code” in understanding how Power Amino Acids® correct the deficiencies in amino acids, positive-charged proteins, and metabolic pathways that normalize body weight and restore metabolic health. A pioneer in the development of the fields of Cell Biology and Molecular Biology and their impact on understanding chronic human diseases, he participated in work that won two Nobel Prizes in Medicine awarded in 1974 and 1999. As a leader in nutritional science and medical research with 40 years of innovative scientific research and 10 years of breathtaking achievements in the fields of obesity and metabolic disease, Dr. Scheele’s passion has always been to “Make the World a Better Place”. After moving to La Jolla in 1998, he has utilized his vast experience to develop superior health-care products for individuals living in today’s fast-paced world. Dr. Scheele is currently the Founder, President, and CEO of NovaLife, Inc. a San-Diego based biotech company that has pioneered in the development of innovative health-care products for people who suffer from obesity and metabolic diseases, including diabetes, lipid disorders, cardiovascular disease, autoimmune disorders, and aging.